We have all experienced certain people in our lives that have left lasting impressions with us. Obviously not all of these experiences have been of a positive nature. We have heard diverse stories about cases of abuse that have scarred many people for years to follow. On the other hand we hear much more about persons who have positively influenced others by their dignity, leadership, personality and/or nurturing individuality that has brought inspiration into someone's reality. Likewise, each of us should emulate our best character qualities to encourage others to do the same. At a recent gathering of persons from Icelandic decent at Grace Lutheran Church a surprise recollection of everlasting inspiration took place. Our Sverrir Magnusson remet one of his grade school students from almost 60 years ago in Akureyri, Iceland. Anna Kristin Hauksd'ottir who now lives in Edmonds instantly recognized her favorite teacher from long ago as he walked to the tour bus that brought her group to the Peace Arch City. 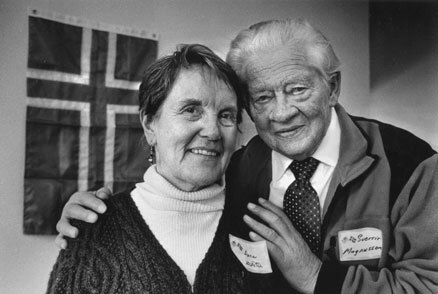 She fondly remembers the encouragement she received from Mr. Magnusson who was intelligent, gentle, kind and inspired her lifelong self confidence.